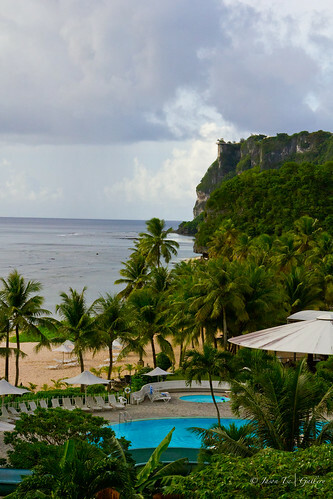 Guam is an unincorporated territory of the United States located in the western Pacific Ocean accordingly to wiki. It has a population of around 180K, about 40K are US troops and approximately 30K Japanese are living here based on my little research. I started with such facts because I do find it quite interesting to see such large population of Japanese living here in Guam. With a monthly average 28K - 30K Japanese tourists visiting Guam, I guess that explains why. The chance is you will see a lot of Japanese tourists at any given moment, Japanese signs are everywhere even in Kmart, public transportation, menus, billboards, fire exit signs and most staff at tourist destinations (both local and perhaps Japanese-Americans) speak fluent Japanese. Come to think of it, NTT DoCoMo Pacific has a branch here in Guam! (beyond excellent mobile 3G reception and great pre-paid mobile data plan by the way) In terms of population density, I am quite certain Guam has more Japanese restaurants than in Hong Kong! Most tourists leaflets are default in Japanese!! I certainly did not expect such a scene prior to my arrival but after just a few days, I started to have the feeling that I am actually in a small city in Japan rather than in Guam, USA! Just in case you are wondering, a lot of the businesses here are also run by Japanese businessmen. 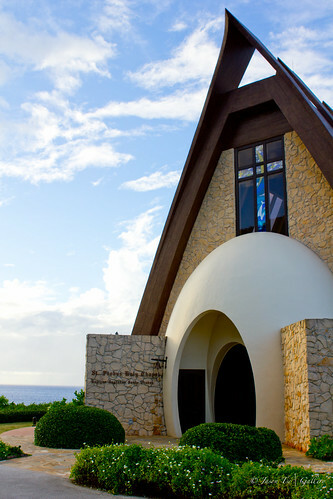 After a personal visits to a few of the famous chapels (most built right next to 5-star hotels but they are managed independently so no obligations of staying at the attached hotels), I think I understand why Guam is now famed for destination wedding. 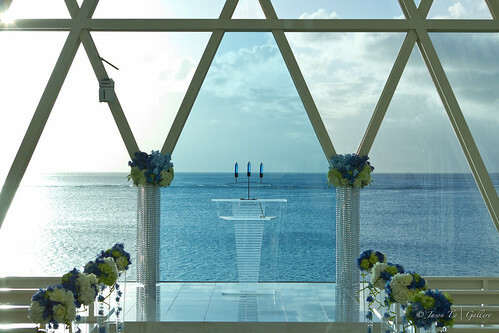 Aside from the heat and humidity, the blue sky, fresh air and sea views would win your heart twice over if you want your wedding to be in such an atmosphere while within a few hours flight in the Southeast Asia region. 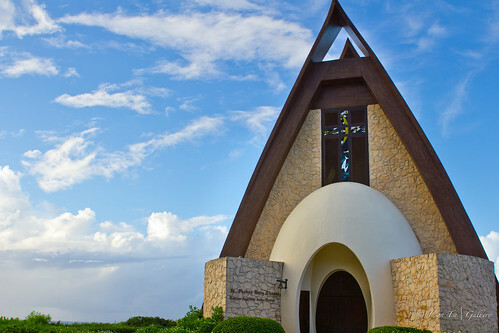 The following two Chapels, St. Probus Holy Chapel and the Blue Aster are operated by Watabe Wedding with the former very close to the Hilton Guam. 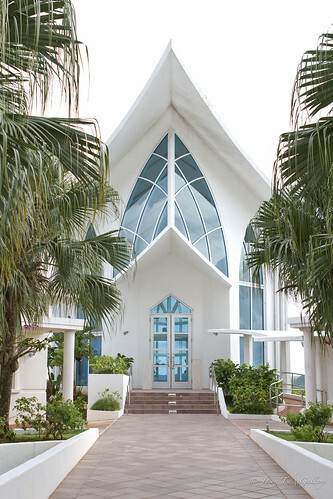 Most of the chapels in Guam (so far as I have observed) are very modern / contemporary with a lot of glass windows and white interior. 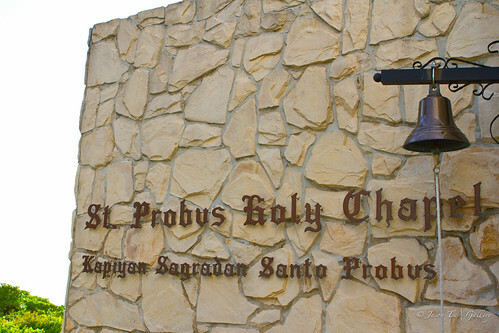 However, this St. Probus Holy Chapel stayed with the wooden interior, classic yet elegant in my opinion. The exterior shape may look rather unusual to some but I think it fits the background very well! A picture is worth a thousand words so I am going to post the pictures I took with minimal captions for your enjoyment. 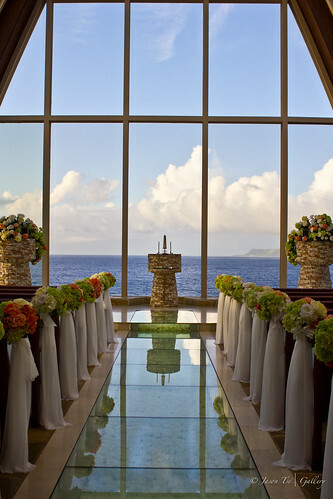 Again, stunning view both interior and exterior. 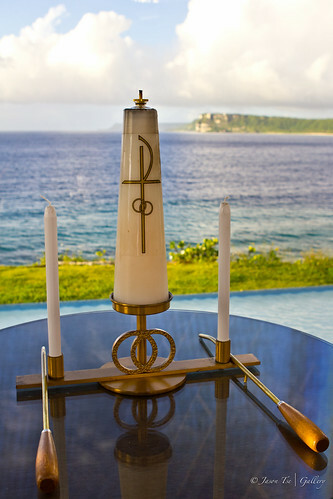 As informed, if lucky, one can see dolphins in the backgrounds flipping out of the water. It happened a few times only but never say never right? 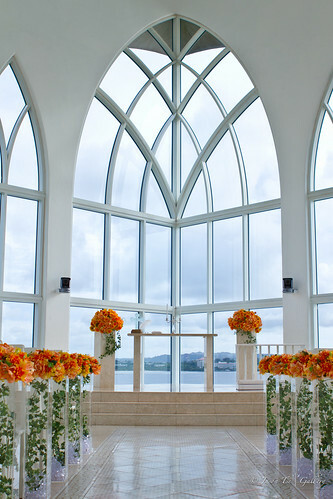 It may not be very clean from the picture below but there are 10,000 silk roses underneath the glass pathway arranged in a ascending sizes up to the altar. Another chapel under Watabe management is the Blue Aster. Quite different from the previous one but also quite nice if you like the view and the clean-cut style. However, no dolphins here due to shallow shore lines at this location. 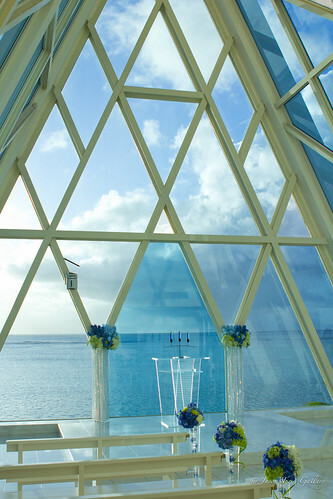 The Crystal Chapel can fit about 80 guests and it has yet another stunning view of course. If you have a chance to look from above at the top floor of Nikko Hotel, you can see the following scene. 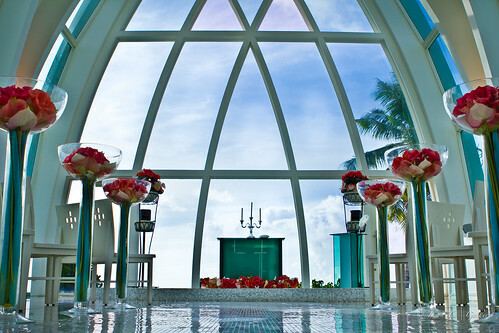 Yep, that's Crystal Chapel in the picture. 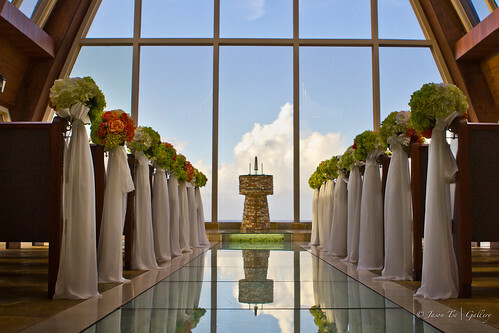 St. Laguna Chapel is another popular pick as informed because of the view and colors. 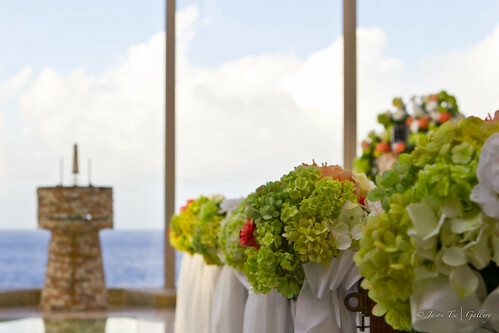 (it is always about the view!) It is rather popular among Hong Kong and Taiwan couples because it was the shooting scene for one of Taiwan's popular TV dramas in 2007. So which one is your favorite? 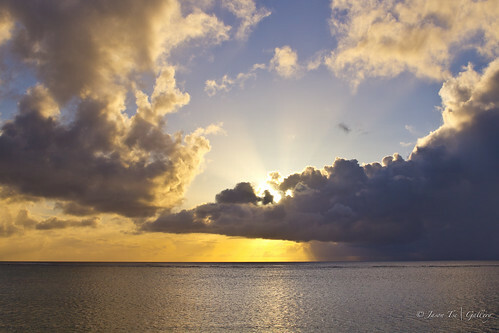 I can't wait to write about 7 meals a day encounters in Guam! Stay tuned! For coverage in Chinese? 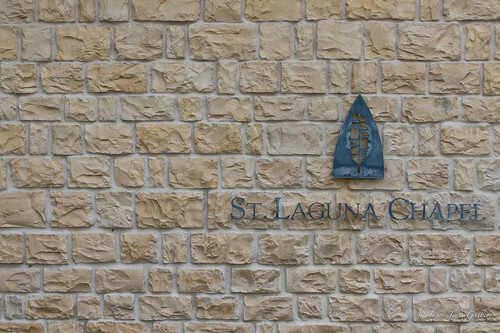 Check out 素顏天使™Sù Yán Tiān Shǐ (plain face angel blog) coverage on these Chapels and what she thinks of them. Beautiful architecture you've got in these photos. 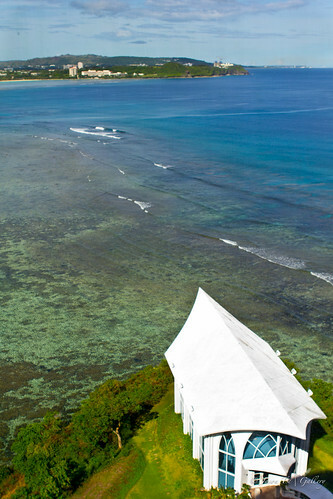 Definitely makes Guam compete in the list of "must see" places. Vlad had found himself longing to encounter those of his own kind, to travel to the streets of Elysia-that far away world, but after a while it seemed more of a fairy tale than anything else. Like Santa Claus and the Tooth Fairy, only with fangs.